With spring finally in session it’s time to update your wardrobe with some new trends. This season a must have in your closet is anything off the shoulder. The off the shoulder trend is definitely a comeback this season with blouses, tops, and dresses. These are ton of options out there in different prints, fits, and fabrics. I love all these options and the details (especially the lace one)! As you can see I’m a fan of the tops that have a flowy, airy look to them. I generally love tops that are a little more roomy and easy to move in, and all these options fit that description! The off the shoulder is definitely a fun and flirty trend that can be paired with items you already own. These all will look great with a pair a jean shorts, jeans, denim skirt, and your favorite sandals. 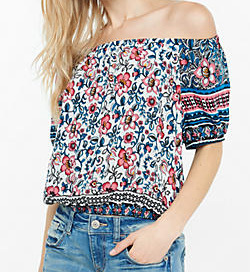 Have you purchased an off the shoulder top this season? What’s your favorite spring trend?